CHICAGO — How do you land new customers? The latest quarterly American Drycleaner Your Views survey asked the trade audience to describe how they put their “best foot forward” to get new customers. 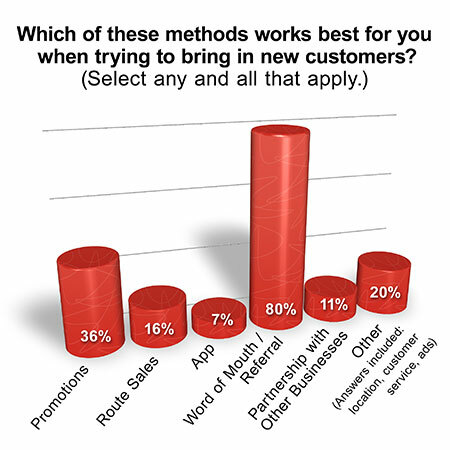 “Word of mouth” was the overwhelmingly clear choice, selected by 80% of respondents, as the most successful method — of many methods — to bring in new customers. The accompanying graph shows the full breakdown of methods indicated by survey respondents (they could select any or all from the choices). When asked about offering wash-dry-fold services, only 51% of respondents said “Yes.” It was a bit surprising given the industry buzz today about diversifying. Eighty-five percent of respondents say they can tell when new customers who have tried their service return. But how do they know for sure? “We check our computer,” notes one respondent. Sixty-five percent indicate their new customers return on a weekly basis, 24% say they return monthly, and the rest say they come back occasionally or are not tracked. That’s the word on landing, and keeping, customers.